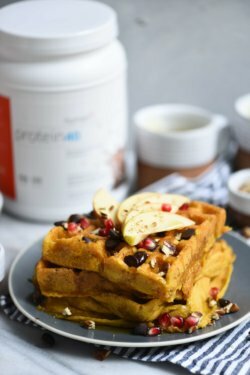 With the weather getting cooler, it’s time to warm up and get cozy in your jammies with some delicious Pumpkin Spice Waffles featuring Protein40. We teamed up with Lexi and Beth at @Crowded Kitchen to create this delicious (and healthy!) recipe. Watch and enjoy! For topping: Maple syrup, chopped nuts, chocolate chips, pomegranate seeds, sliced apple; makes 4-6 large waffles. Preheat waffle maker. In a medium bowl, whisk together flour, cane sugar, baking powder, salt, pumpkin spice & Protein40. In a separate large bowl, whisk milk, egg, maple syrup, pumpkin, vanilla & butter until well combined. Add in dry ingredients and whisk until incorporated. Cook in waffle maker until golden brown and crispy on outside. Top with maple syrup, nuts & chocolate chips. Note: This recipe can also be made into pancakes. Both gluten-free all purpose flour and regular all purpose flour work. You can also use vegan or regular butter. Almond milk can be substituted for other non-dairy or dairy milk. 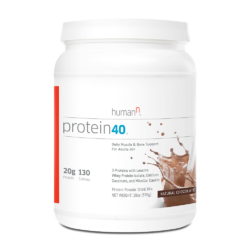 Be sure to tag us with #HumanN so we can see your own Protein40 Pumpkin Spice Waffles.